The IDex Client is an application which acts as a miniature local proxy on macOS and Windows® workstations. It forwards usernames, group membership, and information about web requests to the Smoothwall for web filtering purposes. Each web request is individually identified, therefore it can identify multiple users logged in at the same workstation. Local user accounts are identified by the workstation, as well as users behind a NAT connection. The IDex Client runs without any interaction from your end-users, gathering necessary information directly from the workstation. This has the advantage of not being reliant on a working connection to your domain controllers to be able to function correctly — so long as users can log into the workstation, information can be captured. Additionally, no direct communication path is required between the Smoothwall and the Active Directory. Note: IDex client is not recommended for installing on remote client workstations. Remote connected workstations should use Connect Filter for Windows instead of IDex Client. Note: IDex client cannot filter applications that cannot be configured to use explicit proxy settings. This section describes installing the IDex Client on Windows machines. Connect Filter for Windows and IDex Client cannot be installed together on the same machine. The IDex Client should only be used in trusted networks, therefore only internal (Basic) interfaces can be selected. It is recommended that remote connected workstations use Connect Filter for Windows instead of IDex Client. Should your Smoothwall solution make use of a load balancer, you can use the virtual IP address assigned to the Smoothwall service as an IDex Client interface. You configure such addresses in the Web proxy > Web proxy > Settings page (see Load balancing ) before they can be used in the Guardian > Client interfaces > IDex Client page. 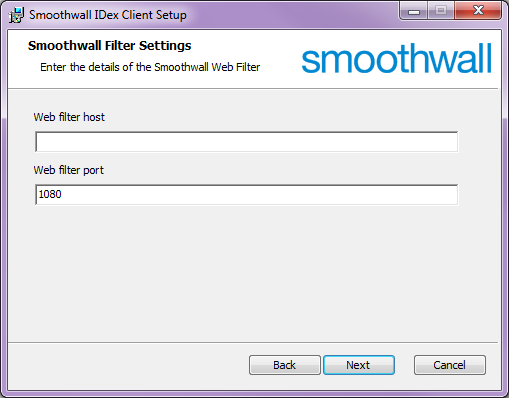 For a detailed description of how to configure the IDex Client to Smoothwall interface, see Setting Up IDex Client Interfaces. If you make use of groups to filter your users' traffic, you must use the IDex Directory to map the domain groups to the local Smoothwall groups. You do this in the Services > Authentication > Directories page — see Configuring an IDex Directory Connection. This method requires repeatedly running the installation on each individual network device. 2. From the IDex Client and Agent Software list, download the IDexClient_x86.msi (for Windows 32-bit) or IDexClient_x64.msi (for Windows 64-bit) installation program to a shared network location. 3. Double-click the relevant installation program — IDexClient_x86.msi (for Windows 32-bit) or IDexClient_x64.msi (for Windows 64-bit). 5. Accept the terms and conditions, and click Next. 8. Click Finish to complete the installation. Note: A reboot is not required to complete the installation. Users will not see an icon in the system tray for the IDex Client. Note: The SWCInstall30.msi installation program can be obtained from your Smoothwall representative. Note: If installing to a clean Windows device, that is, one that has not been assigned to a user yet, or has not connected to the Internet yet, you should launch the system browser (such as Internet Explorer or Edge) now before continuing. You can create an unattended installation to deploy the IDex Client out to all network devices. This section only provides guidance particular to the IDex Client. Using an Active Directory Group Policy Object (GPO), you can create an unattended installation to deploy the IDex Client out to all network devices. This section only provides guidance particular to the IDex Client. For a detailed description of how to setup such a GPO, refer to your Active Directory documentation. From the IDex Client and Agent Software list, download the IDexClient_x86.msi (for Windows 32-bit) or IDexClient_x64.msi (for Windows 64-bit) installation program to a shared network location. 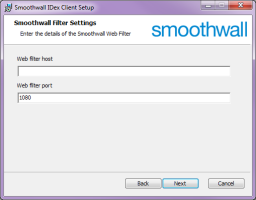 SmoothwallIPAddr String Hostname or IP address of the Smoothwall explicitly configured for communicating with the IDex Client — see Adding the IDex Client to Smoothwall Interface. SmoothwallPort String The port number explicitly configured for the IDex Client interface. The IDex Client can be removed using Windows ® Programs and Features to uninstall the IDex Client ,or by running the IDexClient msi file and selecting the Remove option. Ensure the proxy settings of your network devices are set to localhost:8080. This is used to redirect web traffic from the browser to the IDex Client first. Typically, you would use an Active Directory Group Policy Object (GPO) to achieve this. However, there are alternative methods of distributing proxy settings to all devices — of which detailing these is out of scope of this topic. The IDex Client writes any connection errors to the Application event log (Control Panel > Administrative Tools > Event Viewer > Windows Logs > Application) of the Windows device. Log entries are prefixed with "IDexClient".